Can India Lead the Way on Innovation? 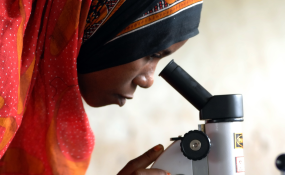 More women are entering the field of science. Can Kenya's Climate Innovation Center encourage business growth and sustainable climate change solutions? Four years ago, Kenneth Ndua quit his job at a local charity and spent his savings designing a cooking stove. Through his job, he saw many people suffering from waterborne diseases and thought of a possible answer. "Fuel is very costly and they cannot even boil water," explained Kenneth. "I thought, 'Why not come up with an idea that can solve all this?'" Kenneth's stove uses recycled biomass as fuel and reduces fuel usage by half. I also has a water chamber that can boil and sanitise seven litres of water whilst the stove is being used for cooking. Even though the stove is proving popular, growing his business Fawandu has proven difficult. "I'm just putting my money in and not going anywhere," Kenneth tells Think Africa Press. A lack of financing and advice has made the distribution and marketing of the stove difficult and caused Kenneth to often consider giving up. Kenneth is one of the entrepreneurs connected to a new Climate Innovation Centre (CIC), which was established by the World Bank Group's infoDev programme in Nairobi during the last week of September. The centre aims to help companies working with climate-related technologies to turn ideas into viable businesses. Launched with the financial backing of the British and Danish governments, the Kenyan CIC is the world's first. It is hosted by the Strathmore Business School in collaboration with Global Village Energy Partnership International (GVEP), PricewaterhouseCoopers (PWC) and the Kenya Industrial Research and Development Institute (KIRDI), and Johannes Zutt, World Bank Country Director for Kenya, believes it will help Kenya "to promote green growth, to protect the environment, to create jobs ... and to increase climate resilience". Other centres are planned for Ethiopia, South Africa, India, Vietnam and the Caribbean. Companies supported by the CIC will have access to funding, business advice, market research, and facilities for the design and development of products. The aim is to give them opportunities to make themselves more attractive to larger investors. "If you look around the world, you will see that there is in fact a fair amount of capital out there looking for investment opportunities ... but they fear going [into] an environment they don't understand" explains Jonathan Coony, coordinator for the infoDev Climate Technology Programme at the World Bank. This fear prevents ventures in their earliest stages of initiation from receiving crucial funding. The CIC plans to fill this funding gap with grants of up to $50,000 for idea development and investment finance of up to $1 million for business expansion. Kenneth Ndua has applied for an investment of $100,000 for his stoves. "That would help me get all the facilities I was looking for and then even the marketing system ... that would get me going", he says. However, it is not just financing Kenneth is hoping for. "I know the CIC has networks and that's the greatest thing". Together with partner organisations, the centre will provide training and business advice, and the Danish Ambassador to Kenya, Geert Aargaard Andersen, also raised the prospect of Danish climate technology companies partnering with Kenyan companies. Finally, the CIC will also act as an industry organisation, working with the Kenyan government on policies relevant to the supported companies. Africa Bio Products Ltd is a Kenyan company producing a cooking gel manufactured from ethanol, a waste product of sugar production. However, because ethanol is subject to a tax of over 100% in Kenya, it is manufactured in Tanzania, which significantly increases the transport costs and therefore selling price. "If the CIC can get the government to reduce the tax, we will make the gel in Kenya", Phillip Njaka of Africa Bio Products Ltd. tells Think Africa Press. However, not everyone is optimistic about the CIC. The director of one company involved with the CIC criticised the quality of the advice and facilities it is providing, claiming they were not suitable for developing high-tech innovations. "If you go and see what they have in that centre, it is not modern," he says. Although the centre was allegedly developed in close consultation with Kenyan partners, the director (who wished to remain anonymous) accused the CIC of ignoring the advice of businesses during the formation of the centre. "I told them, 'Don't pump all the money into a fancy office in Nairobi because you are going to need local stations across the country where you can test things out. Kenya is perfect for that as you have so many different ecological zones'", he recounts. "That was ignored...Soon they will realise [the importance of listening] to the guys who have been through it the hard way". Outstanding questions also remain about the financing of the centre. The CIC has announced that the governments of the UK and Denmark will provide a combined total of $15 million of funding over the next five years. However, Christian Turner, the British High Commissioner to Kenya, reveals that although the UK fully supports the CIC, the full amount is not secured. "We have committed £2million ($3.2million) at the outset. There is £5million ($8million) more in the pipeline depending on how things go. We have a very tight level of accountability to the British Parliament and the British taxpayers...so that is why we put [only] £2million upfront", he explains. Even if the CIC does receive the full $15million, it is still uncertain how the centre will be funded after the first five years. The centre aims to be largely self-financing; however, the World Bank admitted that it is unlikely that returns on investments will be enough to keep the centre running after the first five years without significant government support. World Bank Country Director Zutt claims that there is a risk the centre will be forced to close after five years. "That's something that we'll have to face when we get close to the end of the five year period", he says. Promisingly, Geert Andersen, Danish Ambassador to Kenya, volunteered that Denmark may consider an extension of their support by two or three years. He hopes, however, this will not be necessary: "We are here to support initially and to try to see that this is actually going to be sustainable. I'm quite sure it will", he says. In spite of the uncertainty about the centre's potential impact or financial sustainability, Kenneth is encouraged by its presence. "If I had someone with me four years ago, this would be one of the greatest projects. Maybe this is the time I will start marking a profit." But even without support from the CIC, Kenneth says he would continue. "Maybe I will do my ten cook stoves ... and keep on growing the business slowly. If I have managed the last four years, I believe I can get there [now]."